This post may contain affiliate links. I may earn a small commission from purchases made through them, at no additional cost to you, which helps keep this content free. Please see Disclosure Policy for details. A Dutch baby pancake goes by many names, a German pancake, a Bismarck, or a Dutch puff, but no matter what it is called, it is puffy and makes a delicious breakfast or brunch. 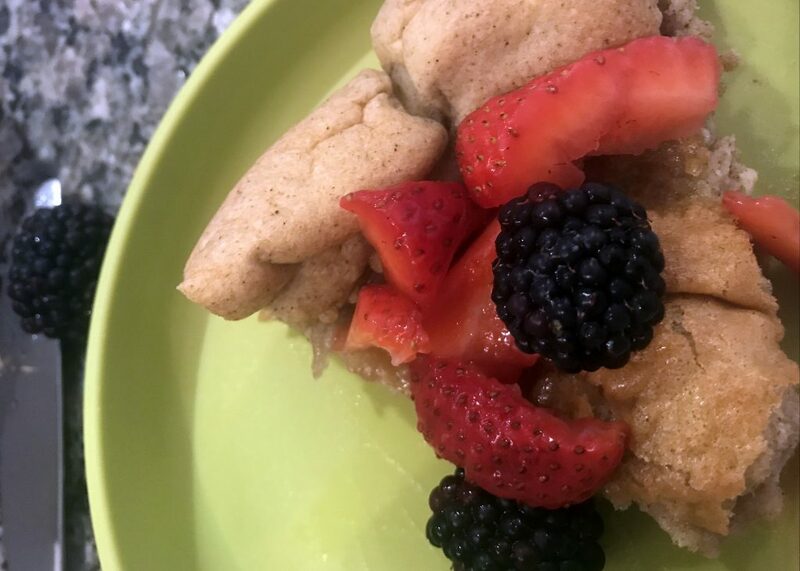 This gluten-free Dutch baby pancake is completely paleo but just as delightful as a normal Dutch baby pancake. A Dutch baby pancake is a popover made from a thin, eggy batter that is baked in the oven. As it bakes, the batter starts to rise and puff around the sides. The edges start to turn a tasty golden brown. Once it’s taken from the oven, its puffiness slowly starts to cave in and you are left with a delicious breakfast treat. 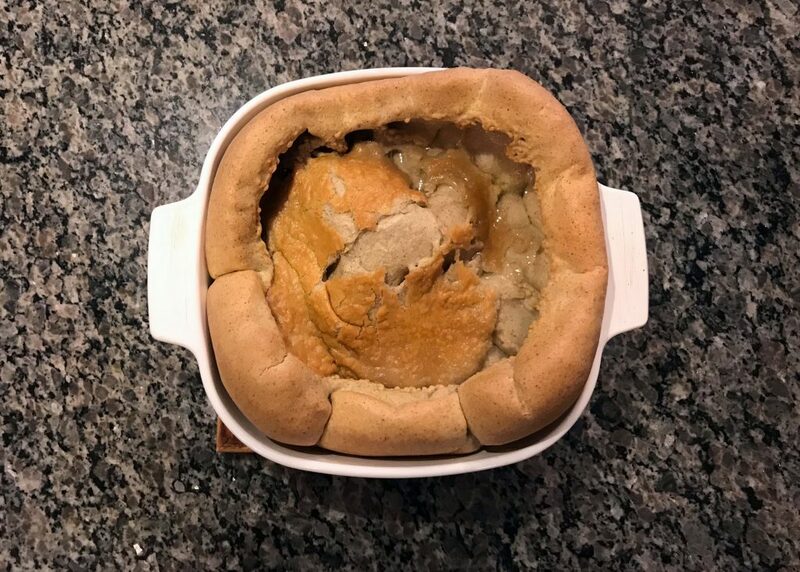 Normally, a Dutch baby is baked in a cast iron skillet, but in this recipe, I use an 8×8 baking dish. Why? Because honestly, I don’t currently own a cast iron skillet. Oh, the shame! But it comes out great, whether you use a baking dish or a cast iron skillet. *I use an immersion blender because it’s easy and minimal cleanup, but feel free to use a regular blender with this as well. Preheat oven to 425°. Put 1/4 cup coconut oil in an 8×8 baking dish and place in the oven while it is still preheating. Leave it in there only long enough to melt the coconut oil. This won’t take long, so get it out before the oil has a chance to smoke. In a mixing cup or bowl, add wet ingredients: 6 eggs, 3/4 cups full-fat coconut milk, and 1 teaspoon vanilla extract. Using an immersion blender, blend thoroughly. In a small bowl, combine dry ingredients: 1/4 cup coconut flour, 1/4 cup arrowroot flour, 1 teaspoon cinnamon, and 1/4 teaspoon salt. Add dry ingredients to the wet batter and using the immersion blender, blend thoroughly. 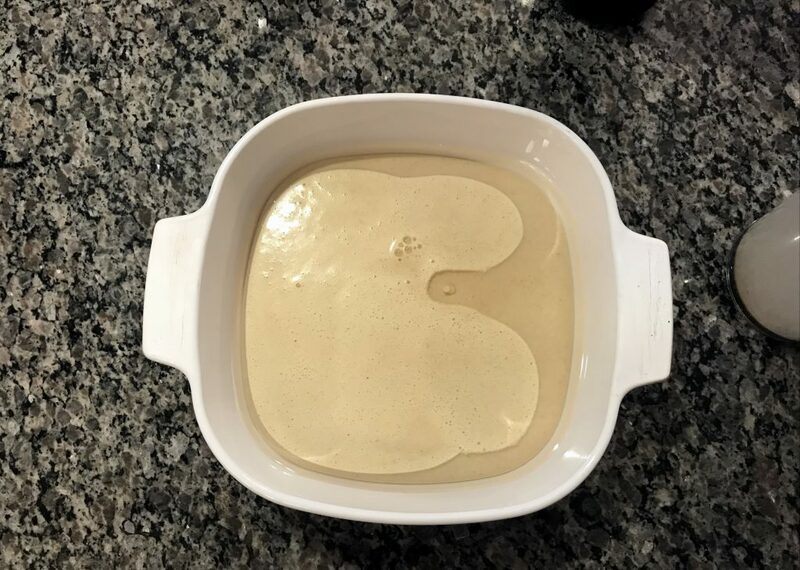 Pour mixture into the 8×8 baking dish with the coconut oil, and bake for 18 to 22 minutes, or until the Dutch baby pancake is golden brown. Let cool for 5 minutes, cut into slices like a pie, and serve with your favorite toppings. What do you put on top of your Dutch Baby Pancake? I plop a handful of mixed berries and drizzle maple syrup on mine. Please share what you do. 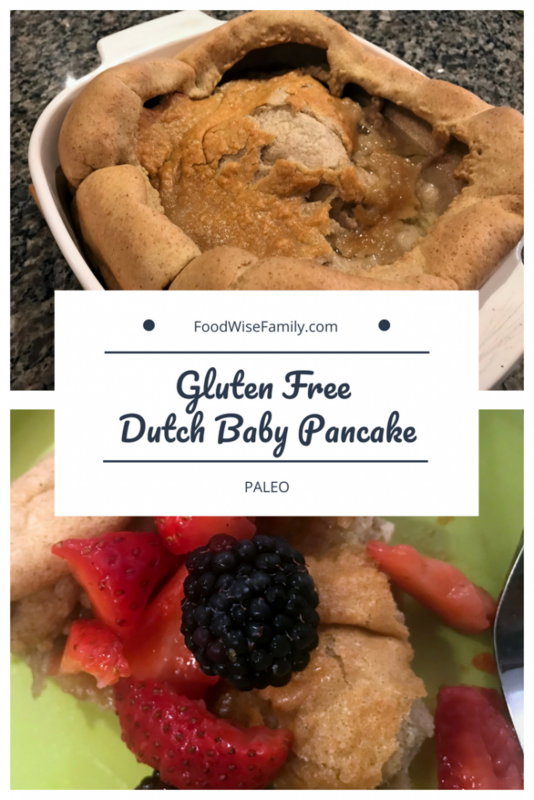 This gluten-free Dutch baby pancake is completely paleo but just as delightful as a normal Dutch baby pancake. Put coconut oil in an 8×8 baking dish and place in the oven while it is still preheating. Leave it in there only long enough to melt the coconut oil. This won’t take long, so get it out before the oil has a chance to smoke. In a mixing cup or bowl, add wet ingredients: eggs, full-fat coconut milk, and vanilla extract. Using an immersion blender*, blend thoroughly. In a small bowl, combine dry ingredients: coconut flour, arrowroot flour, cinnamon, and salt. Add dry ingredients to the wet batter and using the immersion blender, blend thoroughly. Looks delicious and very filling! Thanks! The eggs make it very filling. Oh I love this recipe, simple and interesting to make. Thank you, yes it is so simple. I never heard of this but it literally has is yummy! I love that you don’t need a cast iron skillet to make this delicious dish! I hadn’t ever heard of a Dutch Baby Pancake before, but these look delicious! I loved reading about them! Thanks for reading about them! You should try them sometime. Will have to try this. Looks yummy! I wasn’t familiar with arrowroot flour but now I know what I need to buy! This recipe looks delicious! Can’t wait to try it! Thanks! Arrowroot flour also has other uses. It’s a great thickener, for example replacing cornstarch. Or it’s great for “breading” meats when baking or frying. I never did try dutch baby pancakes before, but these look delicious. Thanks for the recipe! This is new to me, but the dutch baby pancake looks yummy! Thanks for sharing. I’m glad you think so! Thanks for reading. Ooh, I’m definitely going to have to try this! Thank you! And hope you make some soon. They are always a nice treat. I really want to make this. I haven’t made Dutch babies since I went gluten-free. Then definitely give it a try sometime. This recipe is super simple, and I enjoy having something baked that’s gluten-free. This looks so good. I love making popovers, but they are never too healthy with all the cheese in them. I have been experimenting cooking with coconut flour and would love to try this. You should try it. I love how simple this recipe is. Baking with coconut flour has its challenges, but you just have to account for how much moisture the coconut flour absorbs. Looks good! Thanks for sharing the recipe! Yum! 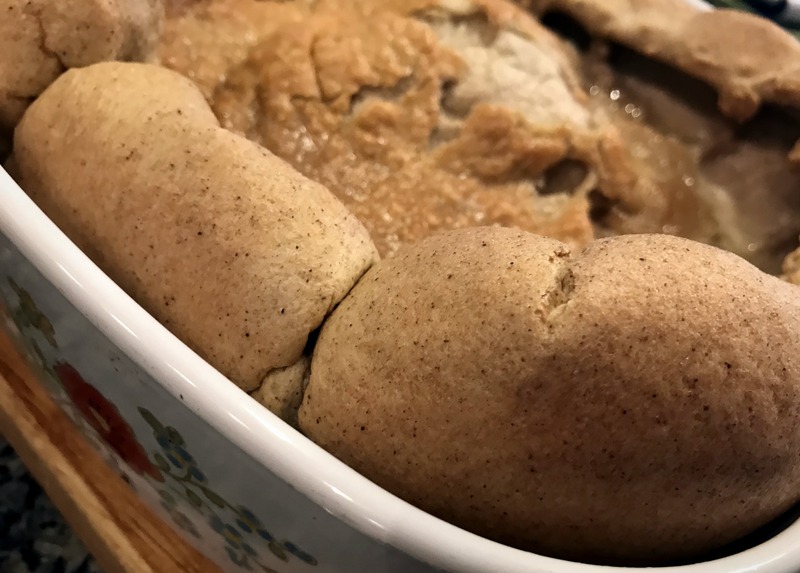 I haven’t made a dutch baby in years – somehow I forgot about them although I used to make them often. I have all these ingredients so this just might be breakfast tomorrow! You should. I love how simple they are. Never heard of these before! They look delish! I wonder if there is an egg free version?? Thanks! I’m not sure if there is an egg-free version, but it’s definitely worth googling. I don’t have any experience with egg replacements, so my advice stops there. This looks delicious! I’ve never had one before. I’m curious to try it! Thank you, and do try it sometime. It’s a simple recipe. I’ve not heard of a dutch baby pancake before, so this was really interesting to read. I pinned the recipe for another time, and will definitely give it a try! Thank you for pinning it for later! Anything puffy, pancake-y or popover, I’m totally in! Love the look of this, yummy! It’s been awhile since I’ve had one, but I love Dutch pancakes!!! This recipe looks delish! I love that someone tried this with Gluten Free! Our family is GF, and so we have never tried making it since GF came into our family. This looks so tasty and simple! Yum! I love using coconut milk as a sub for dairy in my recipes! I will definitely make this one. Thank you Paula! Let me know if you try it. I am so excited to see a gluten-free recipe for this pancake. My family calls them German pancakes and we made them regularly before cutting out gluten. I’m excited to try your recipe, I have all the ingredients in house! It’s always a good feeling knowing you don’t have to go shopping for the ingredients for a recipe you find online. Let me know if you give the recipe a try. You have some of the best recipes!! I can’t wait to try this one!! Thanks Holly! This is one of my favorite recipes for brunch. Oh I have the same baking dish, I always want to try to make dutch pancake, I thought it is only cook on cast iron Dutch oven. No cast iron pan necessary! The Dutch baby pancake still pops over perfectly without. I’ve never made one. this looks so good! Thanks! It’s one of my weekend breakfast favorites!